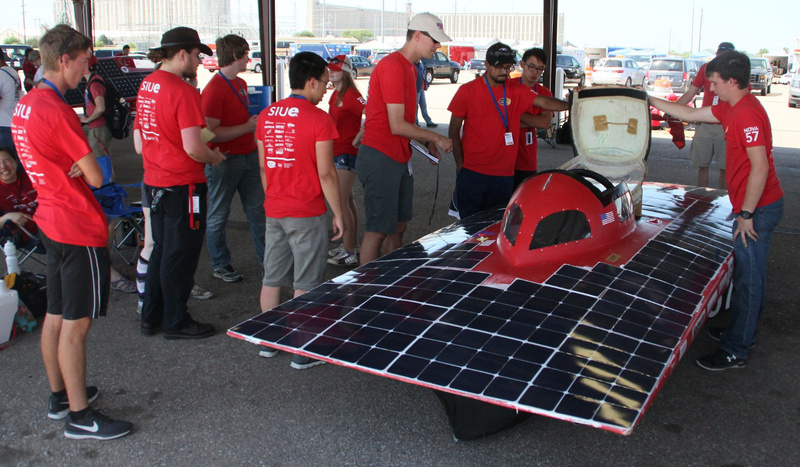 The 20 solar car teams listed below (from 5 countries) are on the board for the American Solar Challenge. A few big-name teams, like Toronto and Stanford, are sitting this one out (probably because of incompatibilities between the WSC and ASC rules). 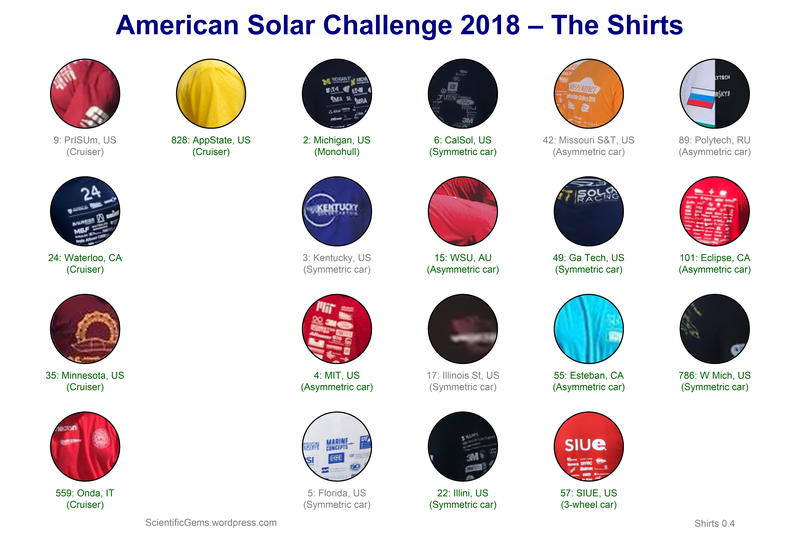 And sadly, Anderson, UCSD, Principia (who raced at WSC 2017), UC Irvine, Phoenix, UT Austin, Rutgers, UC Riverside, Virginia, Northwestern, Calgary, Purdue, USC, Cairo, Sunstang, Puerto Rico, NCSU, NJIT, Alfaisal, and McMaster have dropped out. This teams poster shows the Cruisers in the first two columns (also available with white background and in a shirts version). Route map, coloured by elevation (from −110 to 4351 m). Under grandfathering provisions, older cars (including 3-wheel cars) can race at Motorsport Park Hastings (as a separate class) and participate non-competitively in the ASC itself (provided that they passed scrutineering and qualification for one of the previous events). Only one team (SIUE) is taking advantage of this. I have already begun my blog coverage of the event here, and you can also check out the official ASC social media at (click on the icons). 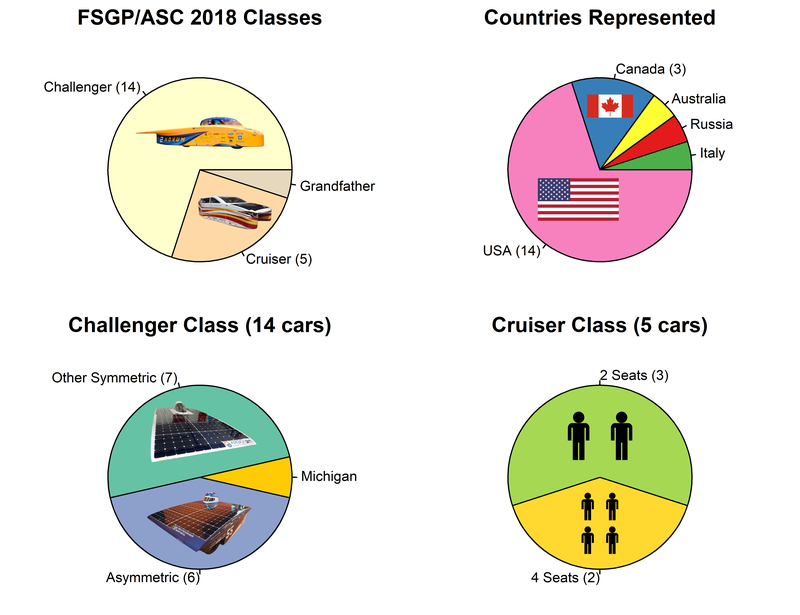 In the teams list below, the small data diagrams show the weight, length, and width of each car, compared to the maxima for its class (for this purpose, the grandfathered cars are treated as part of the Challenger class). The team social media icons are also clickable. This team came 9th at WSC 2013. They came 4th at WSC 2015. They came 2nd at WSC 2017. They came 1st at Abu Dhabi 2015. They came 1st at ASC 2016. They are bringing their existing car to ASC 2018. It is called Novum, and is a GaAs monohull design. It measures 5 × 1 m and weighs 185 kg. An interesting feature of the car is the panels over the wheels, which pop out when making tight turns. The car arrived back from the WSC in January, and was modified for ASC. March saw a scouting of the route, and June a mock race. They are very much the favourites to win ASC 2018. Their team number (2) is a long-standing tradition. They were working late into the night fixing scrutineering issues – and that did the trick! 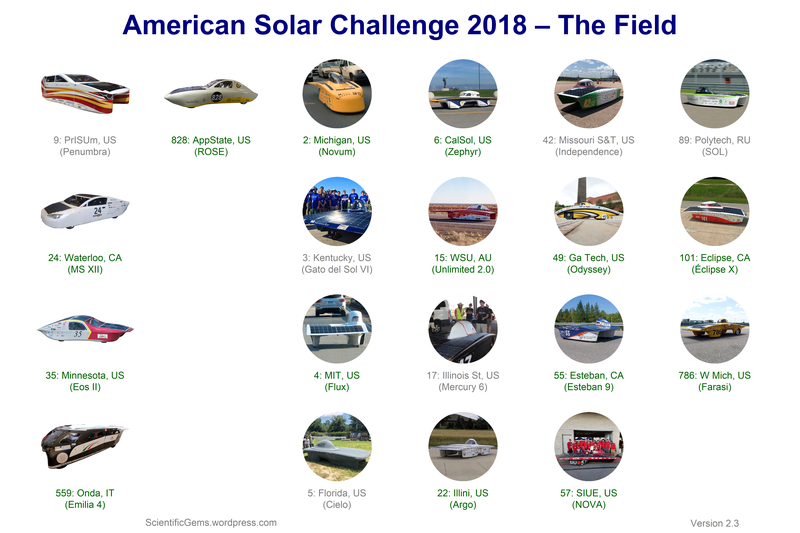 Latest ASC 2018 scrutineering status was 10 green. 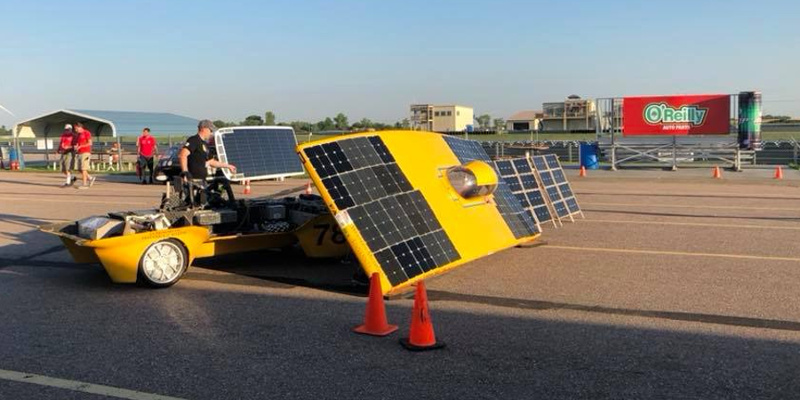 Their FSGP starting position was 11. They have clocked up enough laps on the track to qualify for the road race as well. 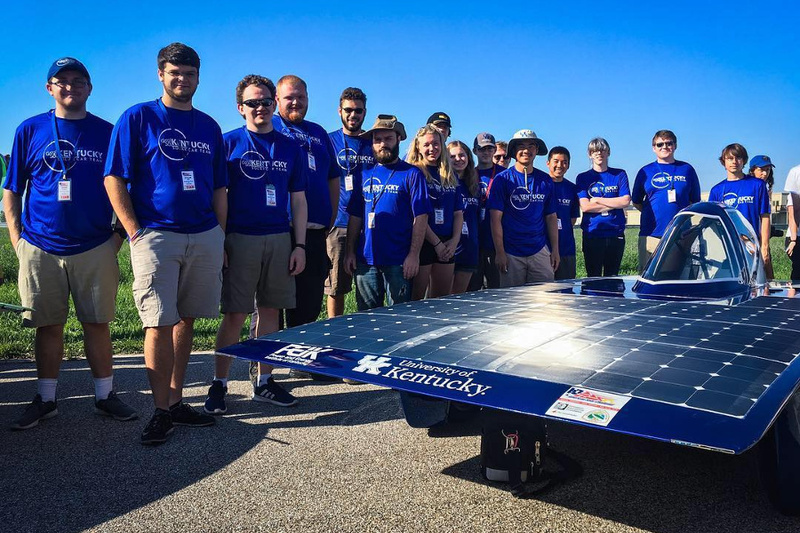 This team came 12th at ASC 2016. They did 80 laps at FSGP 2017. 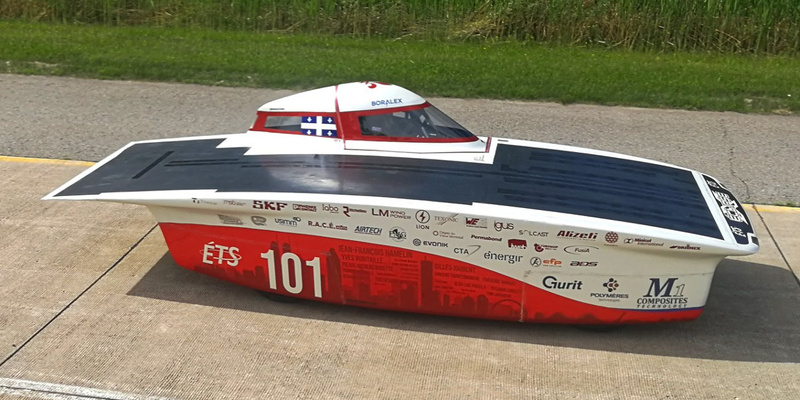 They have built a new car for FSGP 2018 (they are, I understand, not planning to attend the ASC itself). It is called Gato del Sol VI, and is a symmetric design. It measures 4.5 × 1.75 m and weighs 240 kg. They had manufacturing setbacks with their car, and truck problems on the way to Hastings. 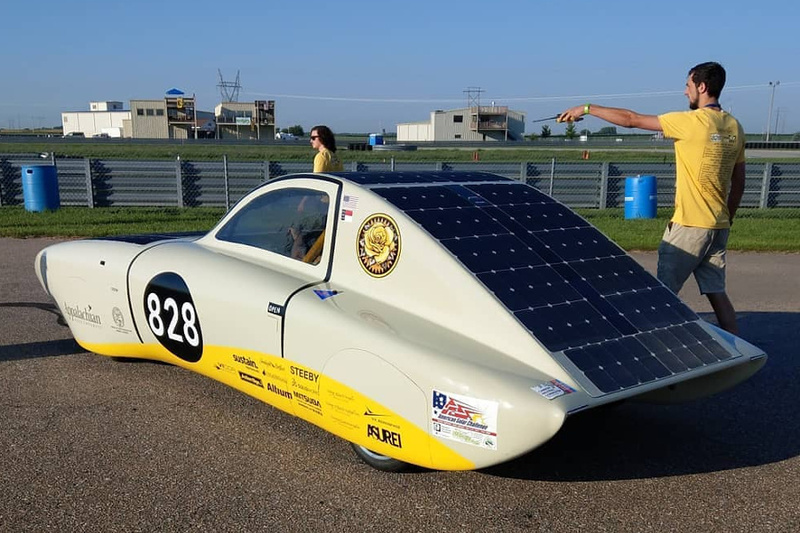 They revealed a not-quite-complete car while travelling, and hope to compete in the track race. 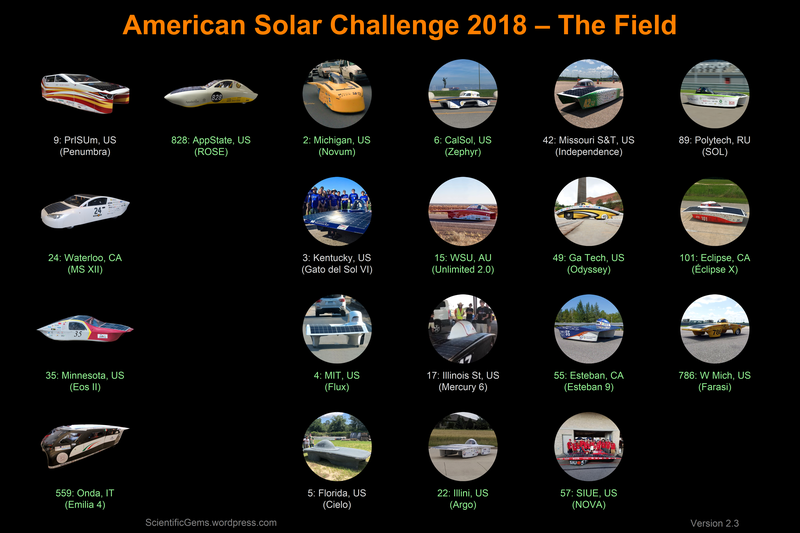 Latest ASC 2018 scrutineering status was 7 green, 1 yellow (out of 10). They had a suspension failure, unfortunately. This team came 23rd at WSC 2015. They are bringing their existing car to ASC 2018. It is called Flux, and is an asymmetric design. It measures 4.5 × 1.91 m and weighs 182 kg. They are 3rd favourites this ASC, if they can repeat their past performance. They were working late into the night fixing scrutineering issues – and that did the trick! Latest ASC 2018 scrutineering status was 10 green. 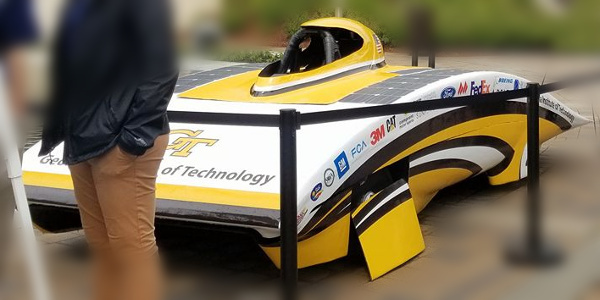 Their FSGP starting position was 8. They have clocked up enough laps on the track to qualify for the road race as well. 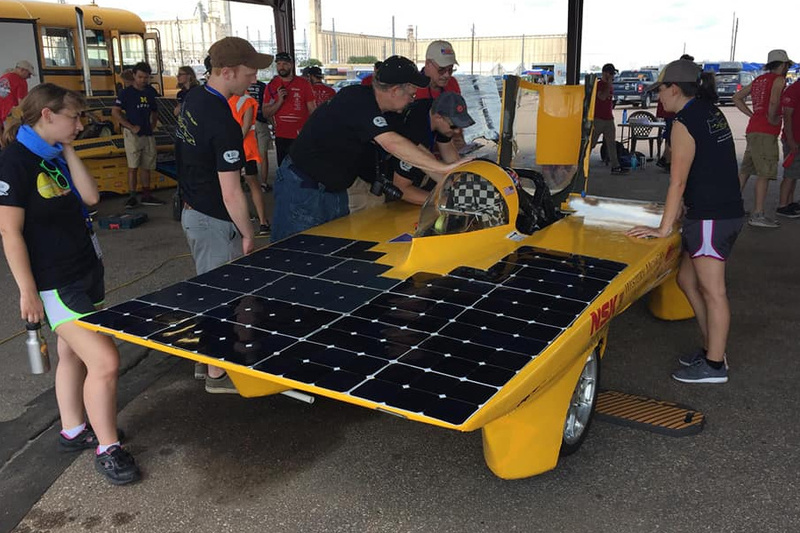 This team did 0 laps at FSGP 2017. 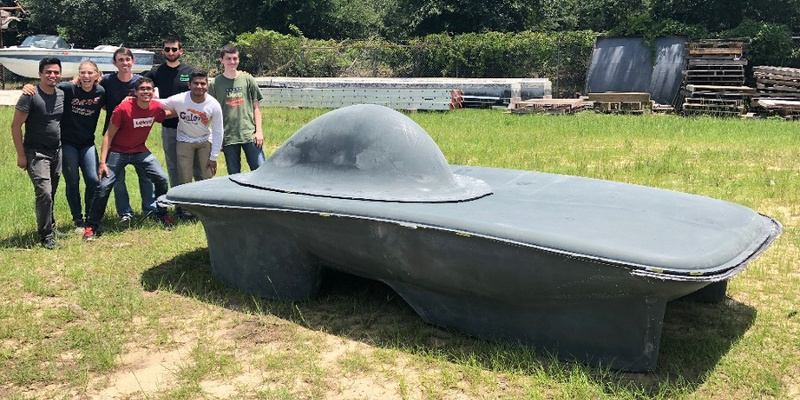 They have built a new car for FSGP 2018 (they are, I understand, not planning to attend the ASC itself). It is called Cielo, and is a symmetric design. It measures 4.1 × 1.8 m and weighs 315 kg. They worked hard on their molds but needed to do some last-minute fundraising. They were working late into the night fixing scrutineering issues – and that did the trick! 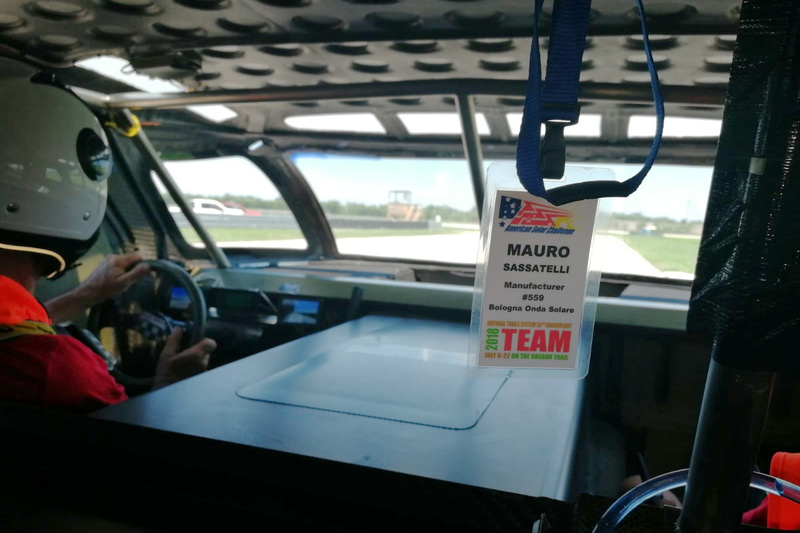 Latest ASC 2018 scrutineering status was 7 green, 3 penalty. 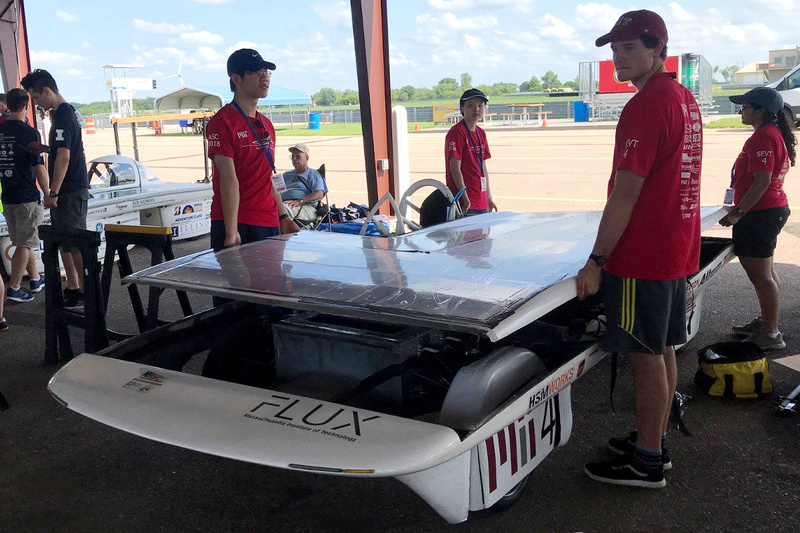 Their FSGP starting position was 16. They will not be continuing on to the road race, however. This team came 9th at ASC 2016. 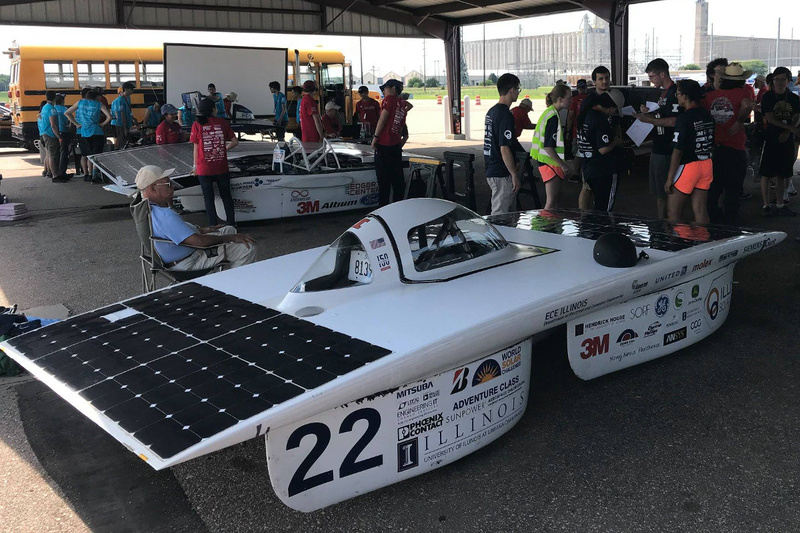 They did 228 laps at FSGP 2017. They are bringing their existing car to ASC 2018. It is called Zephyr, and is a symmetric design. It measures 4.92 × 1.77 m and weighs 200 kg. They had originally planned to build a cruiser called Tachyon (with plans changing from 2 to 4 seats). They were working late into the night fixing scrutineering issues – and that did the trick! Latest ASC 2018 scrutineering status was 9 green, 1 penalty. 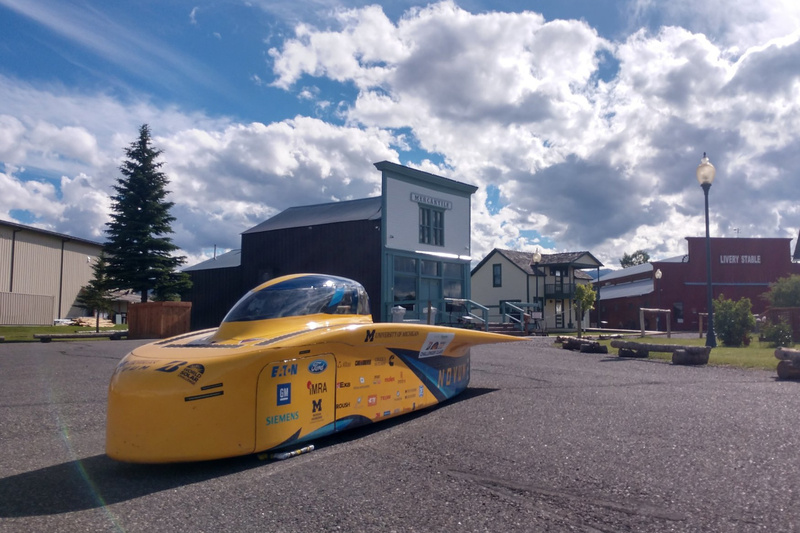 Their FSGP starting position was 10. They have clocked up enough laps on the track to qualify for the road race as well. 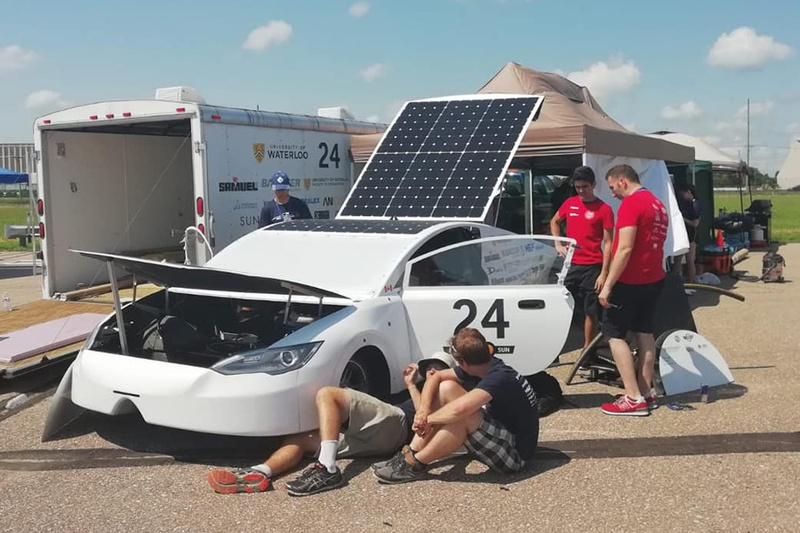 They lost a wheel during the scrutineering brake test, but repaired it. This team participated in the WSC 2017 Cruiser class. They came 7th at ASC 2016. They are bringing their existing car to ASC 2018. 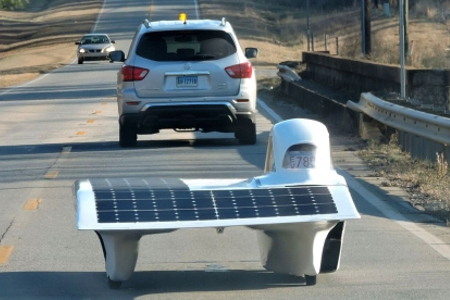 It is a 4-seat Cruiser (with a 15.1 kWh battery), called Penumbra. It measures 4.32 × 1.88 m (making it the shortest Cruiser) and weighs 471.9 kg, with a drag coefficient of 0.2. An interesting feature of the car is the use of bulges on the side to reduce the aerodynamic effect of the blunt end. The car arrived back from the WSC in December. They made minor modifications for ASC. 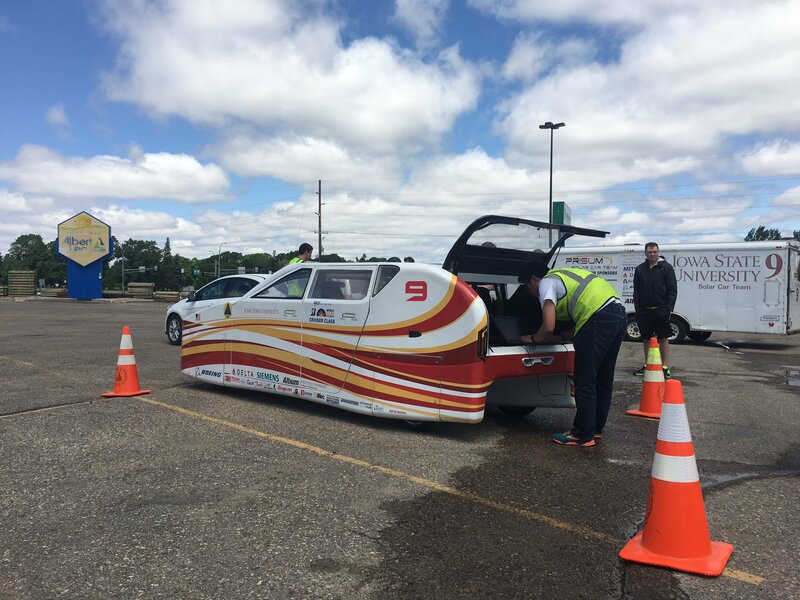 They held a mock race against Minnesota on June 3, where both cars finished at the same time. 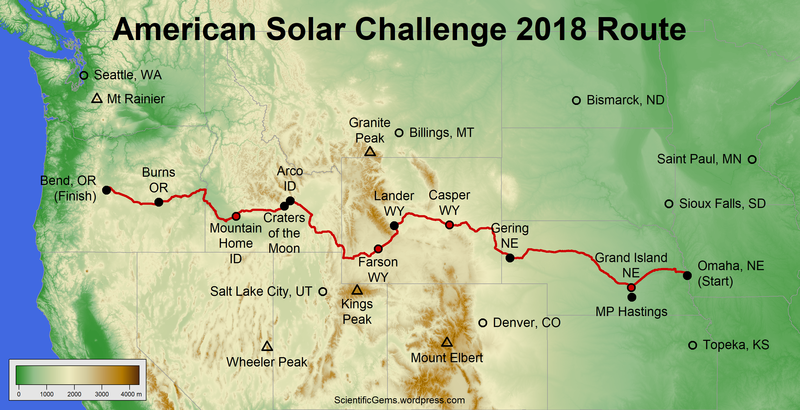 They also held their usual SunRun from June 11 to 20. They were working late into the night fixing scrutineering issues – and that did the trick! Latest ASC 2018 scrutineering status was 6 green, 4 penalty. 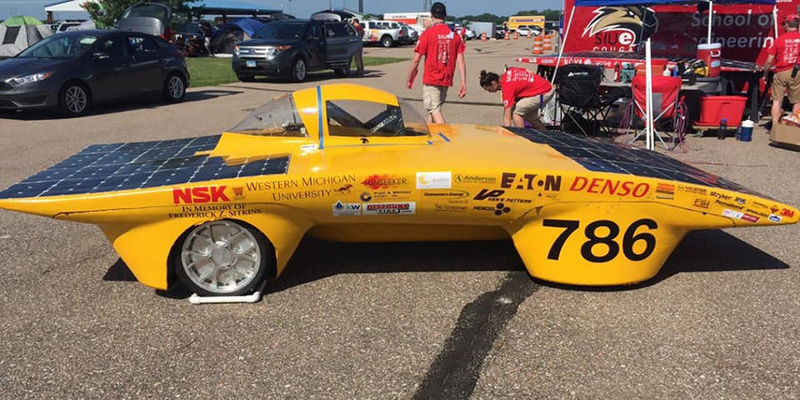 Their FSGP starting position was 17. They will not be continuing on to the road race, however. They appear to have had serious electrical problems. This team came 11th at WSC 2013. They came 10th at WSC 2015. They came 6th at WSC 2017. They are bringing their existing car to ASC 2018. It is called Unlimited 2.0, and is a catamaran design. It measures 4.58 × 1.55 m and weighs 158.4 kg. 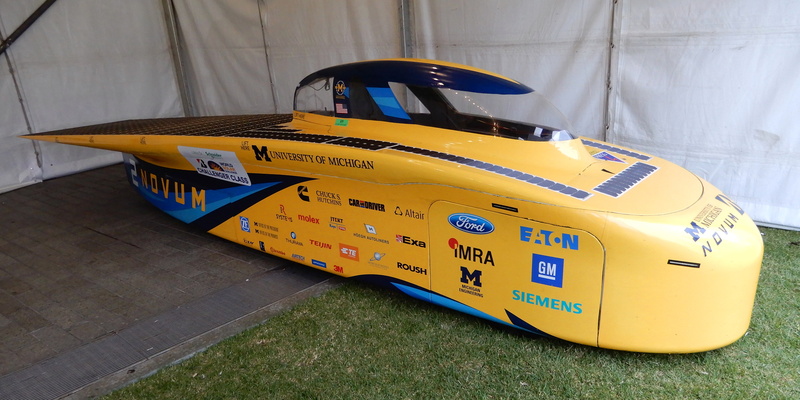 As with Michigan in 2016, they added a bulge on the side of the car to satisfy ASC regulations. They are supported by Bridgestone, and will run on Ecopia tires. 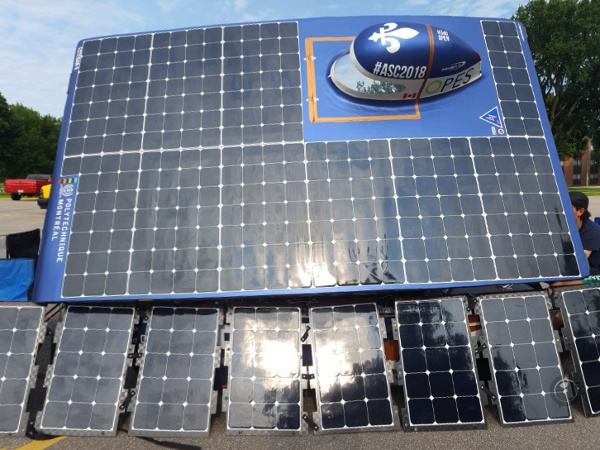 They shipped their car to California on May 14, with the team following by air on 12 June, and driving the race route in reverse. This ASC marks their first competition outside Australia. They are 2nd favourites this ASC, if they can repeat their past performance. Latest ASC 2018 scrutineering status was 8 green, 2 penalty. 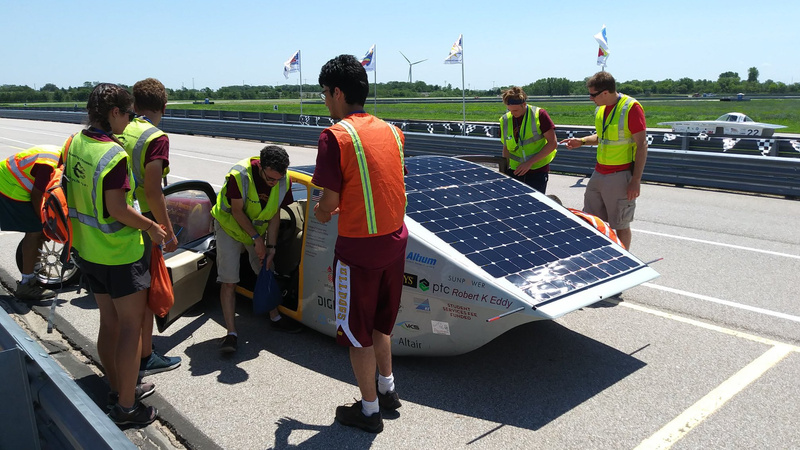 Their FSGP starting position was 7. They have clocked up enough laps on the track to qualify for the road race as well. Their fastest lap on the track was over 80 km/h. This team came 13th at Abu Dhabi 2015. They came 11th at ASC 2016. They did 172 laps at FSGP 2017. They have built a new car for ASC 2018. It is called Mercury 6, and is a symmetric design. It measures 4.35 × 1.35 m and weighs 270 kg. They turned up at scrutineering on Sunday. Latest ASC 2018 scrutineering status was 4 green, 6 penalty. 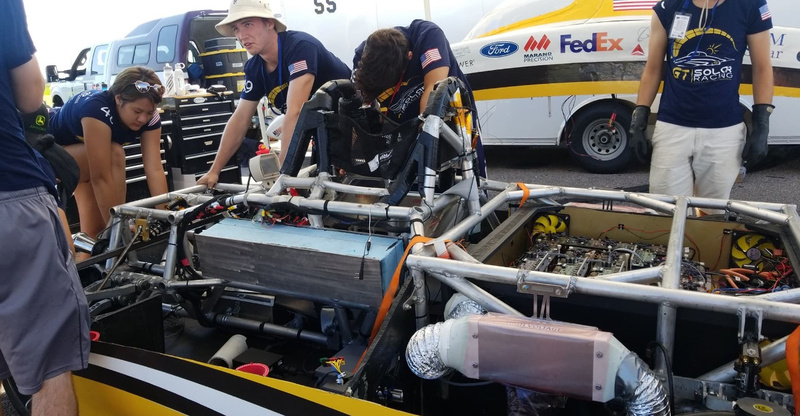 Their FSGP starting position was 18. They will not be continuing on to the road race, however. This team participated in the WSC 2017 Adventure class. They are bringing their existing car to ASC 2018. It is called Argo, and is a symmetric design. It measures 4.5 × 1.8 m and weighs 224 kg. They are particularly proud of their battery box. The car arrived back from the WSC in December. Latest ASC 2018 scrutineering status was 10 green. 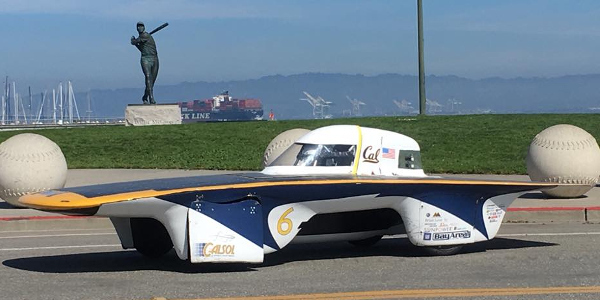 Their FSGP starting position was 6. They have clocked up enough laps on the track to qualify for the road race as well. This team did not qualify for ASC 2016. They have built a new car for ASC 2018. 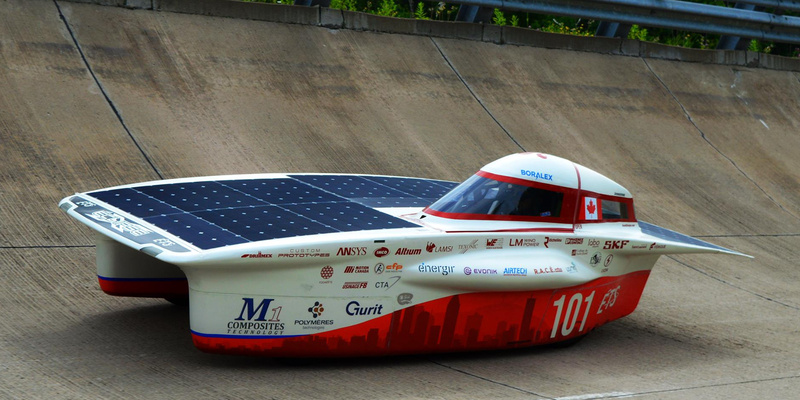 It is a 2-seat Cruiser (with a 15.9 kWh battery), called MS XII. 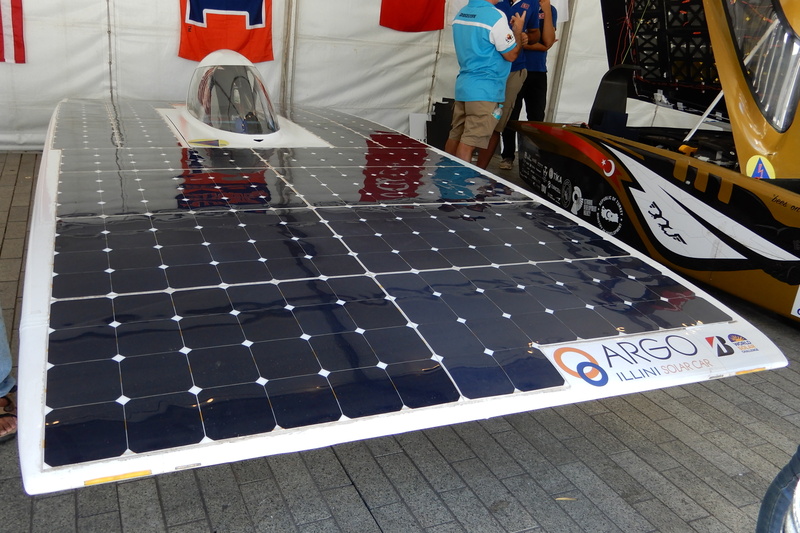 It measures 4.68 × 2.02 m and weighs 475 kg. They hope to take their car to Australia in 2019. 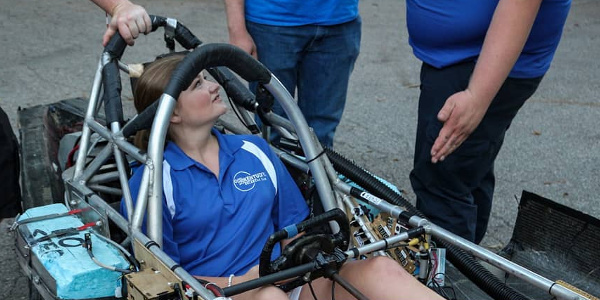 They demonstrated their rolling chassis before unveiling their car on June 30. They were working late into the night fixing scrutineering issues – and that did the trick! Latest ASC 2018 scrutineering status was 8 green, 2 penalty. 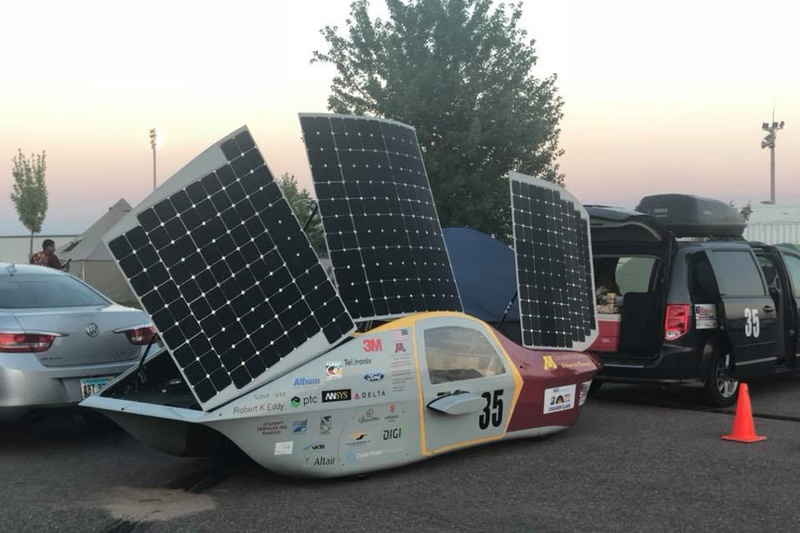 Their FSGP starting position was 13. They were granted provisional qualification for the road race. This team came 4th in the WSC 2013 Cruiser class. They came 5th in the WSC 2015 Cruiser class. They participated in the WSC 2017 Cruiser class. They came 10th at ASC 2016. Basically, they are America’s Cruiser class pioneers. They are bringing their existing car to ASC 2018. 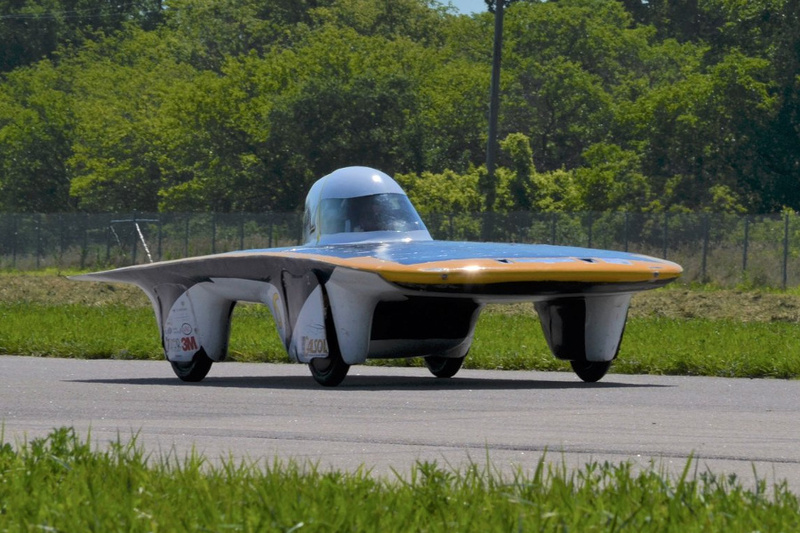 It is a 2-seat Cruiser (with a 6.8 kWh battery), called Eos II. It measures 5 × 1.9 m and weighs 379.5 kg. They are particularly proud of their custom motors. 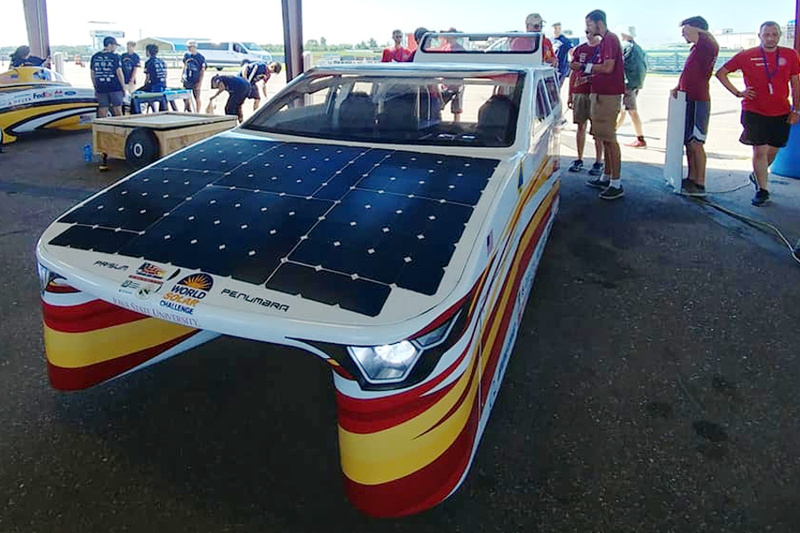 They held a mock race against PrISUm on June 3, where both cars finished at the same time. They are doing regular vlogs about their ASC progress. Their team number (35) is derived from the Interstate 35 highway. They were working late into the night fixing scrutineering issues – and that did the trick! Latest ASC 2018 scrutineering status was 10 green. 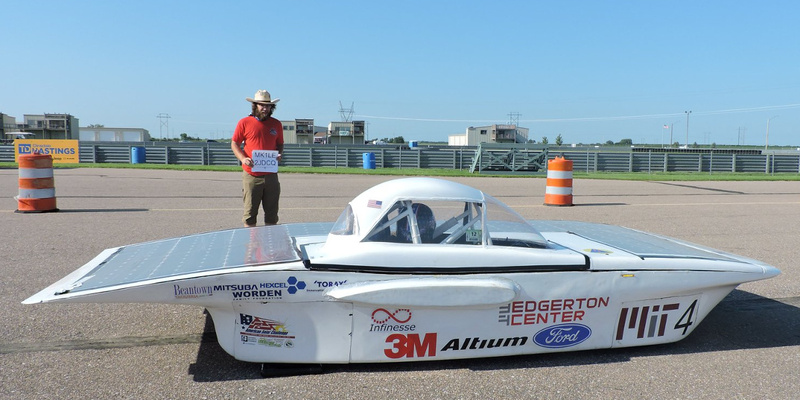 Their FSGP starting position was 3. They have clocked up enough laps on the track to qualify for the road race as well. They reported on scrutineering via YouTube. This team came 4th at ASC 2016. They did 69 laps at FSGP 2017. They have built a new car for ASC 2018. It is called Independence, and is a catamaran design. It measures 4.45 × 1.58 m and weighs 175 kg. 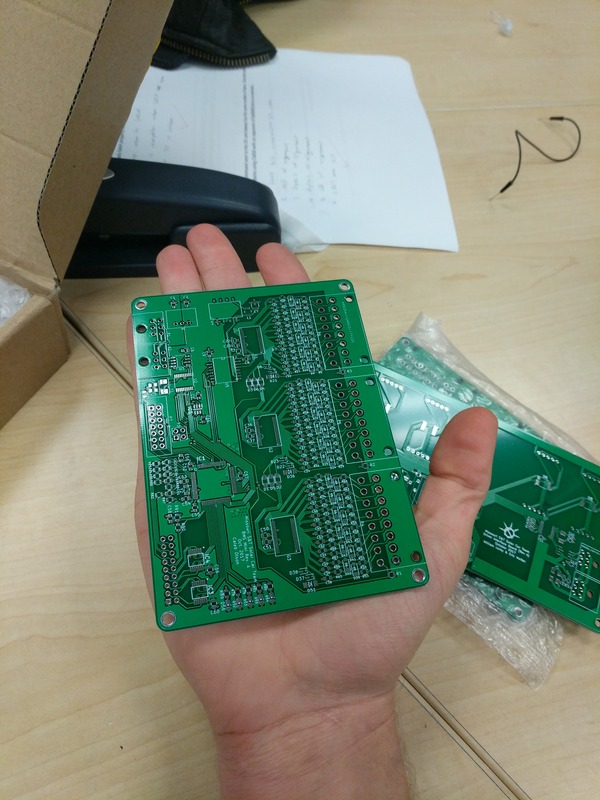 They are particularly proud of their super tiny BMS. They unveiled their car on April 18. They were working late into the night fixing scrutineering issues. 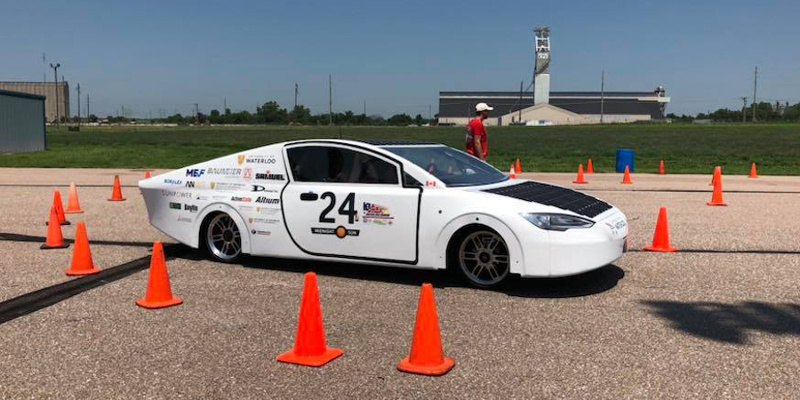 Latest ASC 2018 scrutineering status was 6 green, 1 penalty, 1 yellow (out of 10). 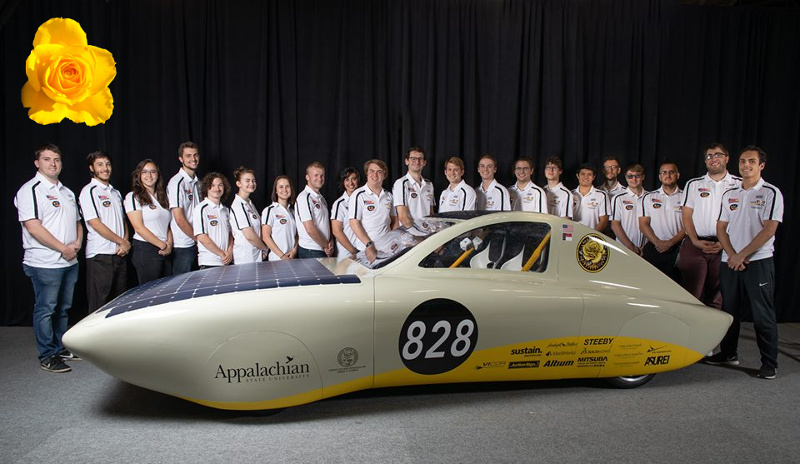 This team did not qualify for ASC 2016. They did 89 laps at FSGP 2017. They have built a new car for ASC 2018. It is called Odyssey, and is a symmetric design. It measures 4.5 × 1.8 m and weighs 250 kg. They unveiled their car on April 24. Their team number (49) is taken from STS-49, the maiden flight of the space shuttle Endeavour (which was the name of their first car). Latest ASC 2018 scrutineering status was 9 green, 1 penalty. 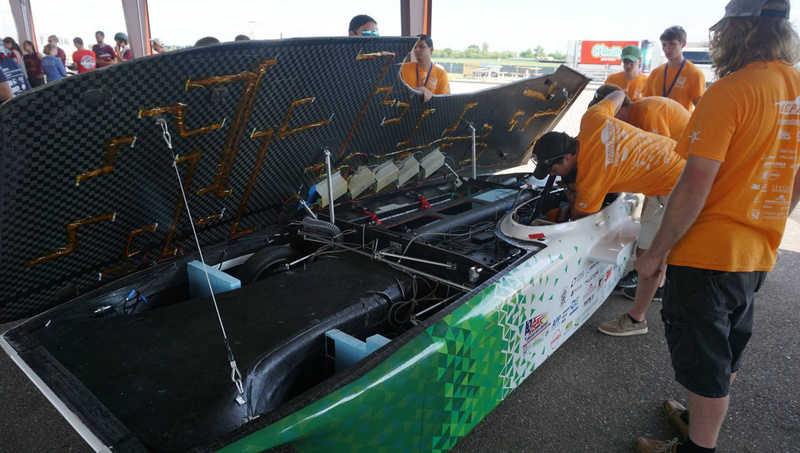 Their FSGP starting position was 12. They have clocked up enough laps on the track to qualify for the road race as well. This team came 10th at ASC 2016. They did 198 laps at FSGP 2017. They have built a new car for ASC 2018. It is called Esteban 9, and is a compact catamaran design. 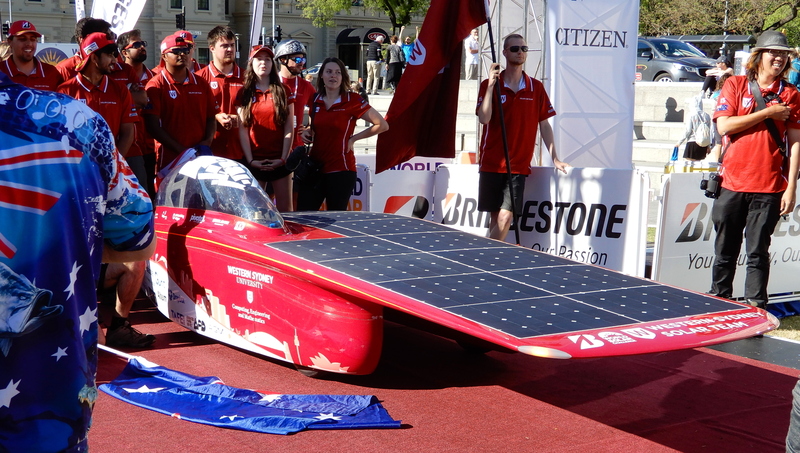 It measures 3.17 × 1.84 m (making it the shortest Challenger) and weighs 175 kg. They unveiled their car on April 23 and did some serious test-driving. 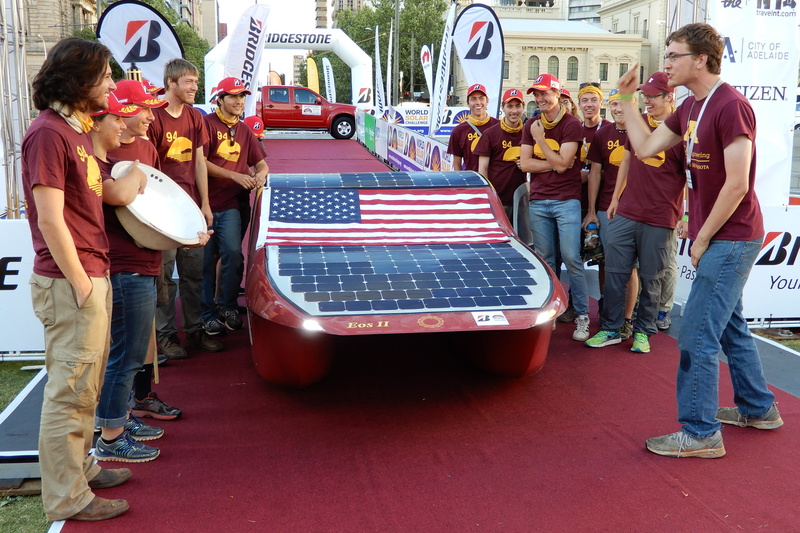 With their zippy little car, this team is a strong contender for the top spot. 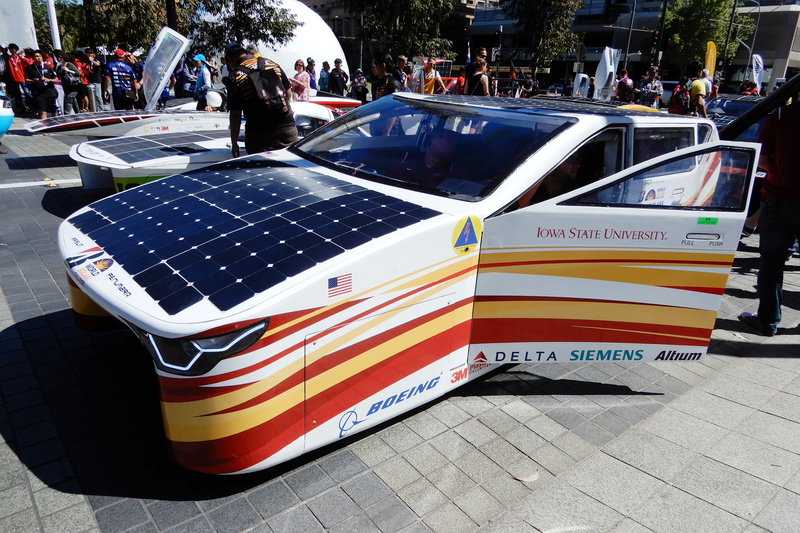 Their team number (55) is the year that Western Electric began to sell licenses for silicon PV technology. Latest ASC 2018 scrutineering status was 10 green. 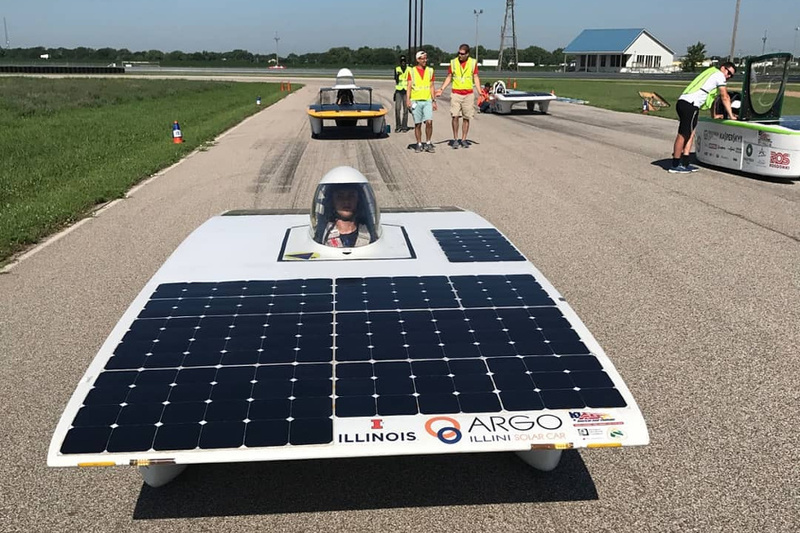 Their FSGP starting position was 2. They have clocked up enough laps on the track to qualify for the road race as well. 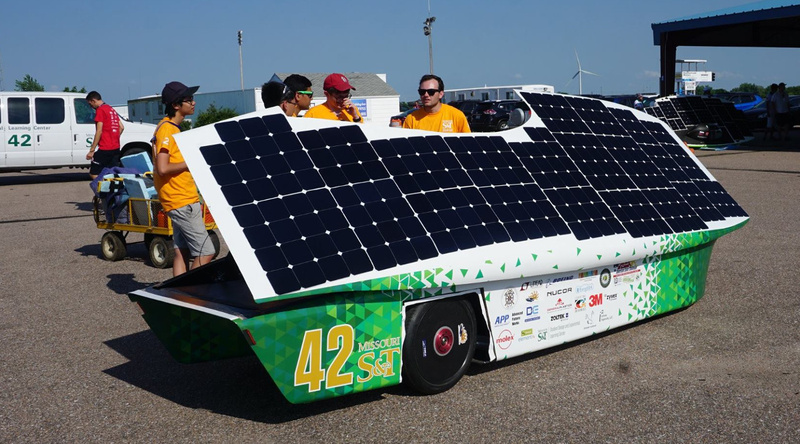 This team did not qualify for ASC 2016. They did 57 laps at FSGP 2017. They are bringing their existing car to ASC 2018. It is called NOVA, and is an older 3-wheel design. It measures 4.52 × 1.7 m and weighs 306 kg. 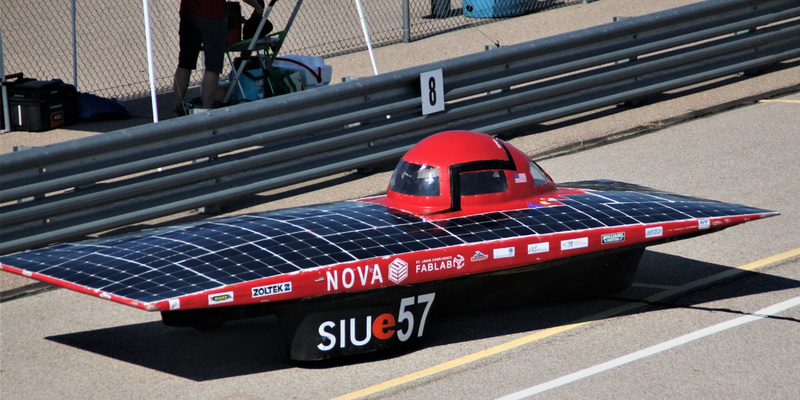 For SIUE, the race is an opportunity to farewell a car which they have lightened and given a new array. They have also been working on a new battery box. Latest ASC 2018 scrutineering status was 9 green, 1 penalty. 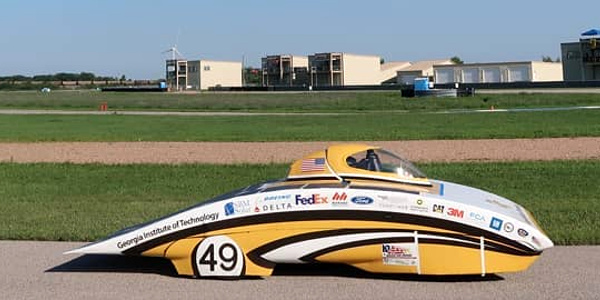 Their FSGP starting position was 14. They were granted provisional qualification for the road race. Because they have an older-style car, they are racing non-competitively. 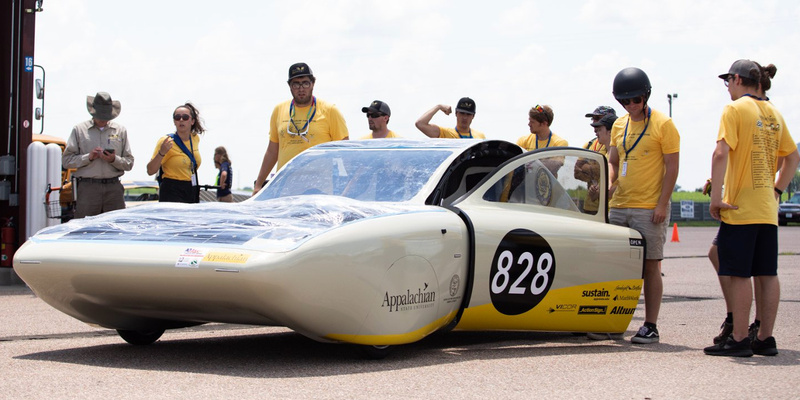 This team is bringing their existing car to ASC 2018. It is called SOL, and is a catamaran design. It measures 4.18 × 1.91 m and weighs 305 kg. They are particularly proud of the many Russian components in their car and their extensive media coverage. 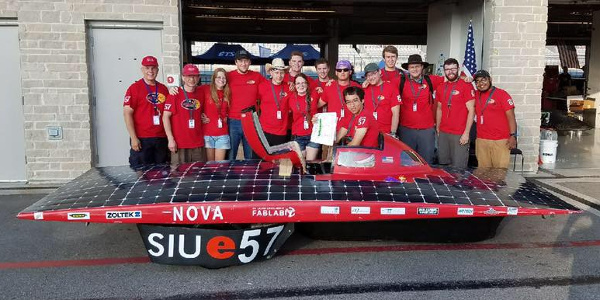 Since they originally built their car for WSC 2017 (although they did not attend), they have made modifications necessary to satisfy ASC regulations, as well as completing work on the electrical systems. They posted a nice photograph of their suspension. 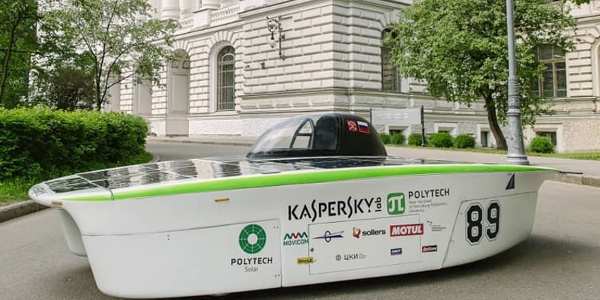 The team flew out on June 29, after doing an 11.7-km run on the track at Sochi on June 20, and air-freighting their car. They left this a little late, but still got their car to the track on time. 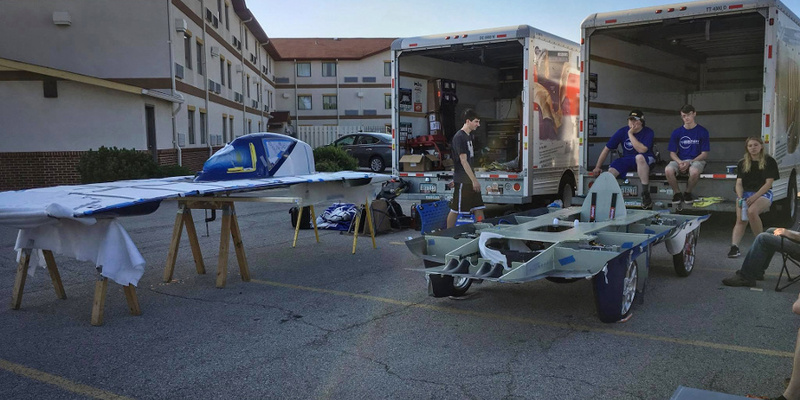 When ASC is over, they plan to build a 4-seat Cruiser for WSC 2019. They were working late into the night fixing scrutineering issues – and that did the trick! Latest ASC 2018 scrutineering status was 9 green, 1 penalty. 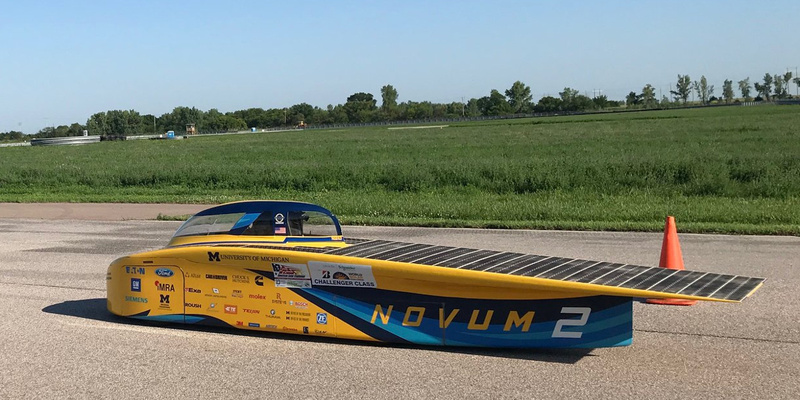 Their FSGP starting position was 9. They will not be continuing on to the road race, however. This team came 18th at WSC 2013. They came 8th at ASC 2016. They did 174 laps at FSGP 2017. They have built a new car for ASC 2018. It is called Éclipse X, and is a catamaran design (with the driver on the left). It measures 3.95 × 1.65 m and weighs 165 kg. They are particularly proud of their low weight. They unveiled their car on May 16 and did some serious test-driving. They left for the track on July 1. Latest ASC 2018 scrutineering status was 10 green. 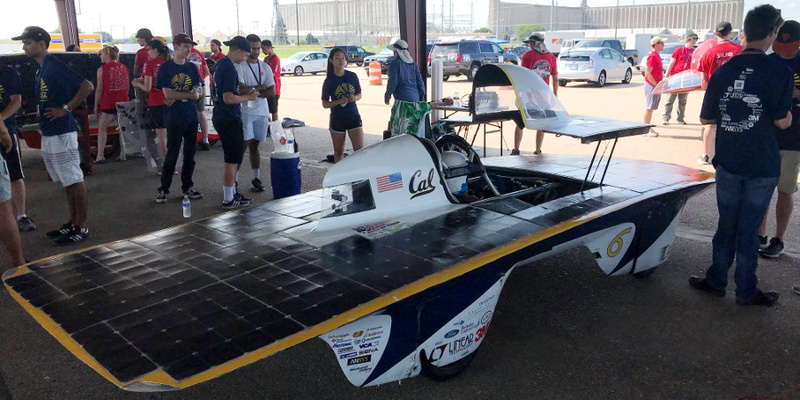 Their FSGP starting position was 1 (because they were first through scrutineering). They have clocked up enough laps on the track to qualify for the road race as well. This team came 10th at WSC 2013. They came 10th at Abu Dhabi 2015. They came 6th at ESC 2016. 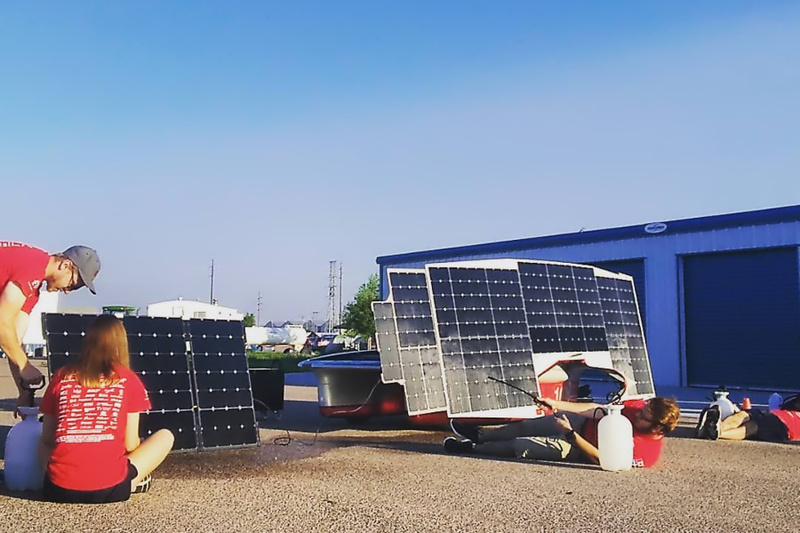 They won the 2017 Albi Eco Race and came 2nd in the Evolución class at the 2016 Carrera Solar Atacama. They have built a new car for ASC 2018. 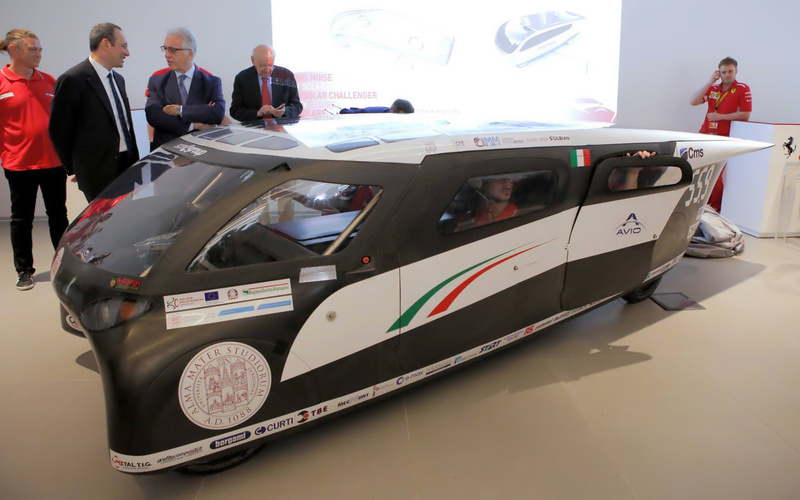 It is a 4-seat Cruiser (with a 16.8 kWh battery), called Emilia 4. 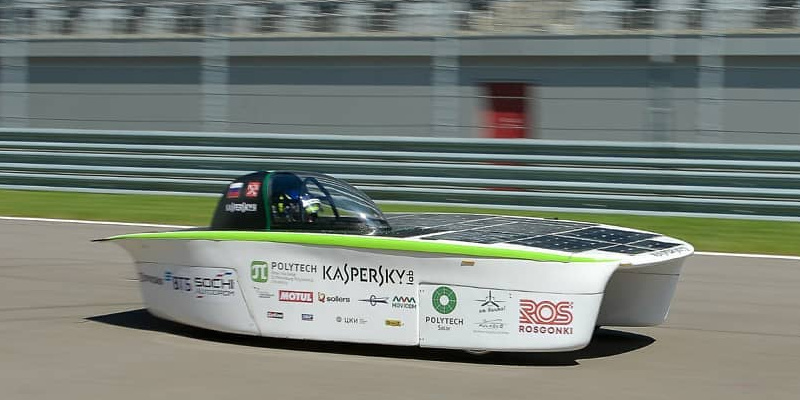 It measures 4.6 × 2.06 m and weighs 320 kg, with a drag coefficient of 0.2. They revealed their car on 11 June, prior to air-freighting it on 14 June and the team flying out later. They also verified that their barbeque still works. 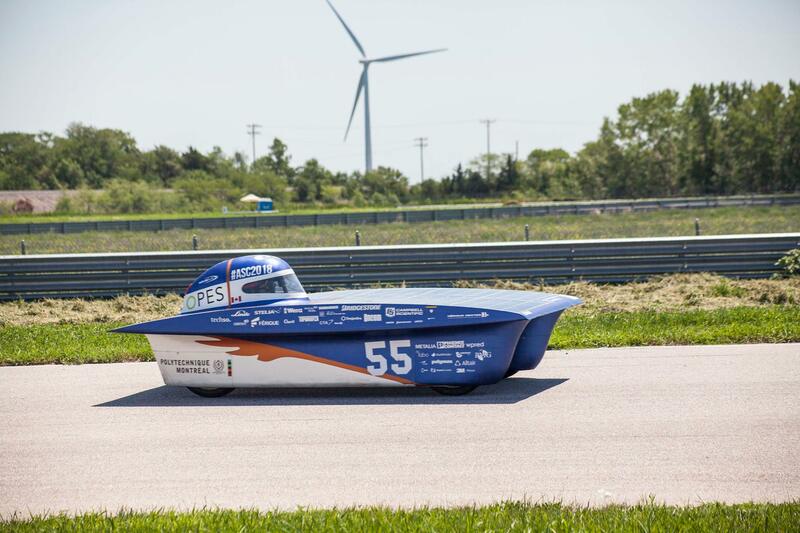 They passed through the small Danish town of Elk Horn, Iowa on the way to the track. 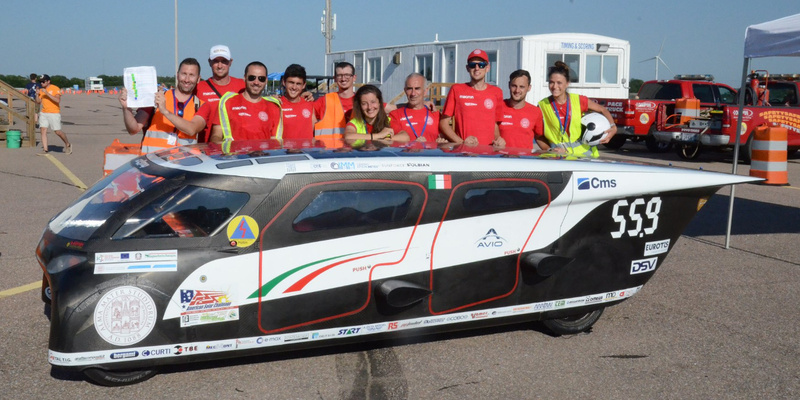 Their team number (559) is taken from the SS 9, the highway through Bologna, which was once the Roman Via Aemilia (hence also the name of their vehicle). Latest ASC 2018 scrutineering status was 10 green. 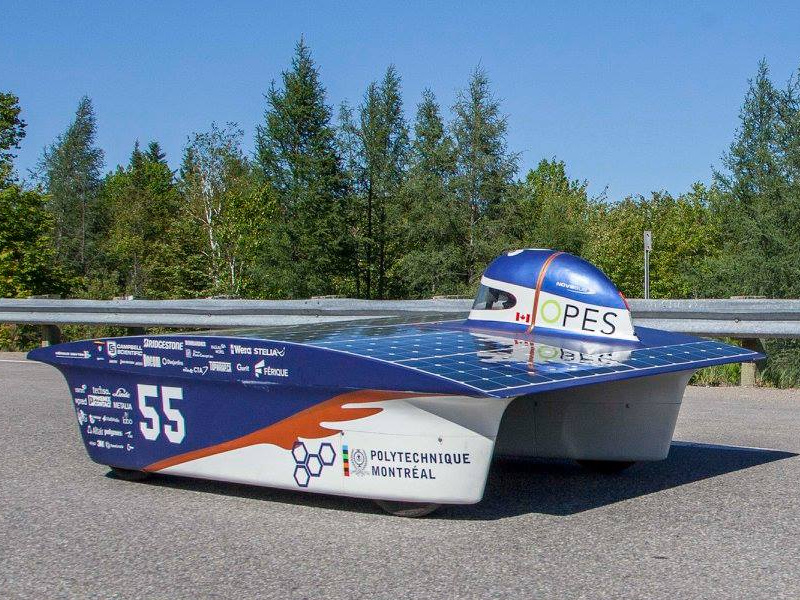 Their FSGP starting position was 5. They have clocked up enough laps on the track to qualify for the road race as well. 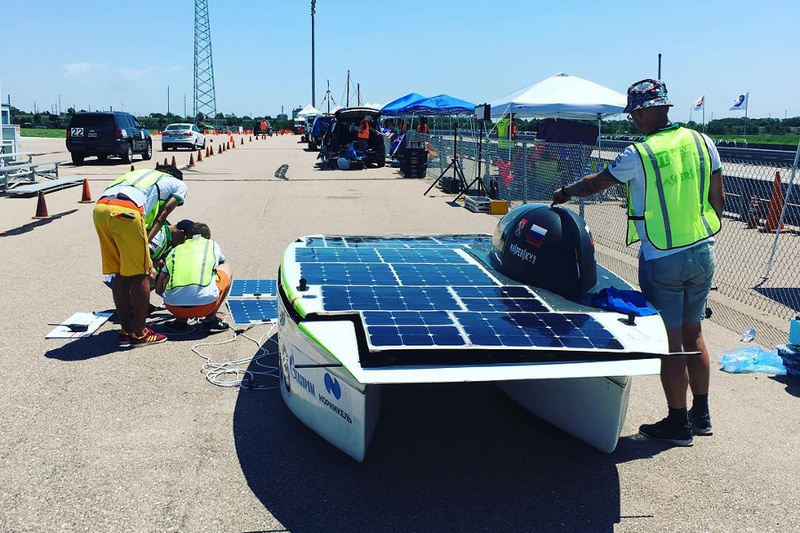 This team did not qualify for ASC 2016. They did 1 lap at FSGP 2017. They are bringing their existing car to ASC 2018. It is called Farasi, and is a symmetric design. It measures 5 × 2.2 m and weighs 316 kg. They arrived late with truck problems. Their team number (786) is the sequence of digits for S-U-N on old phones. Latest ASC 2018 scrutineering status was 9 green, 1 penalty. 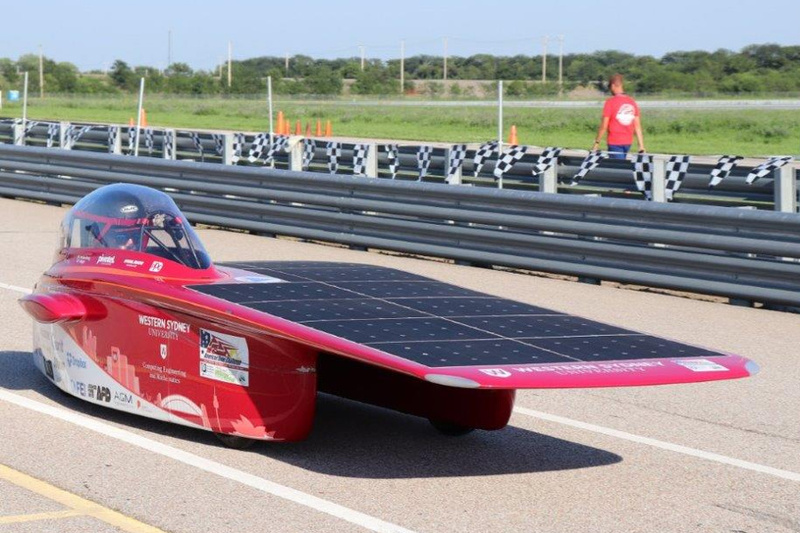 Their FSGP starting position was 4. They were granted provisional qualification for the road race. This team came 6th at ASC 2016. They did 218 laps at FSGP 2017. 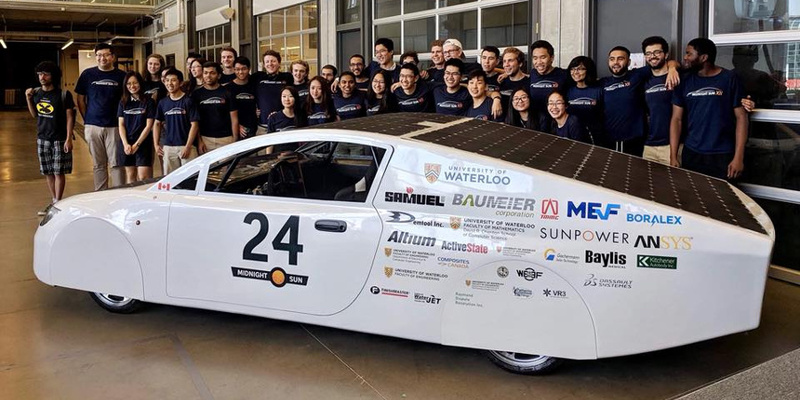 Members participated in WSC 2017 with the Antakari team, and they hope to take their new car to WSC 2019. They have built a new car for ASC 2018. It is a 2-seat Cruiser (with a 11 kWh battery), called ROSE. 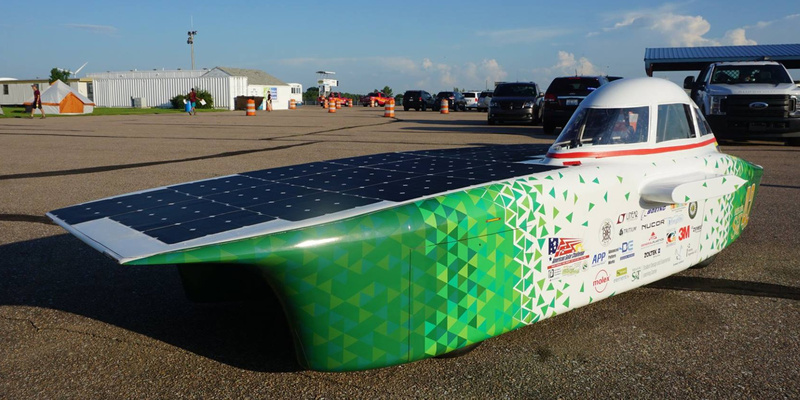 It measures 4.8 × 2.1 m and weighs 362 kg, with a drag coefficient of 0.17. They are particularly proud of the cup holders, apparently. 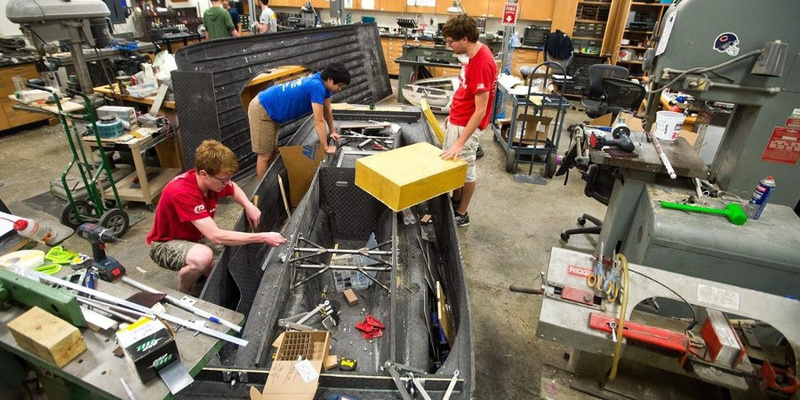 They showed their roll cage and sanded molds, before finally unveiling their car on June 22. Their university wrote an excellent article about them. They posted a nice photograph of their suspension. Their team number (828) is the telephone area code for western North Carolina. Latest ASC 2018 scrutineering status was 9 green, 1 penalty. 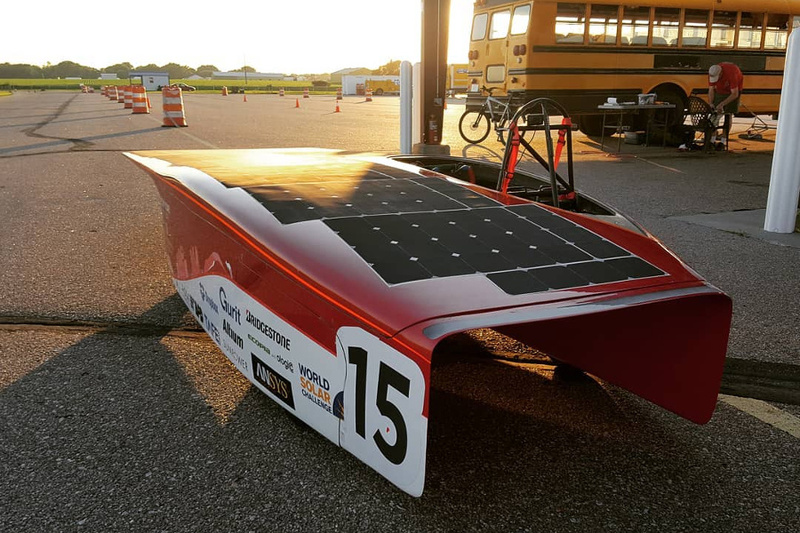 Their FSGP starting position was 15. They were granted provisional qualification for the road race. They are blogging here.